From now through Aug. 31, 2016, we’re accepting votes for your favorite entry from the “Home That Built Me” essay contest. All five of the finalists who submitted the stories below will receive a Linda Fuller-signed copy of “Beyond the American Dream” — the first book written by our founder Millard Fuller but the last to be published. The top vote-getter from our five finalists will receive special recognition after voting is complete. EDITOR’S NOTE: Voting is now closed. Cheryl’s story was selected as the winner. My father built our house. He tore down abandoned houses and did remodeling work, over the years and turned our house into a beautiful, love-filled dwelling. It has hardwoods, and a huge walk-around fireplace. We cleaned the bricks, cleaned the nails from the boards, hauled materials from different places, and of course, bought some new materials. I started helping build the house when I was 5 years old. I was daddy and mama’s little helper. I cleaned old mortar off of bricks, and stacked them to be used on our “new home“. The land was a cow pasture and had to be cleared away. It is down in a little valley and is always where my heart is, no matter where I am. My Mother will be 84 in August, and when she needs constant care, I will stay with her full-time and watch over her. The energy inside is that of warm chocolate chip cookies and a soft blanket. The wooden floors came out of an old school house and daddy put screws and pegs in each board, sanded the floors and clear-coated them to keep the natural look of the wood. My parents divorced when I was in high school, and my mother and I kept the house going. She means everything to me, as we have fought so many battles together and the house feels comforting like a true home should. The energy inside is that of warm chocolate chip cookies and a soft blanket. We decided to keep the fireplace as a wood burning fireplace, to keep the appeal of real wood burning, instead of changing over to gas, with the times. I recall sitting, in the foundation, that was also dug and poured, by hand, many years ago. My daddy and I sat on the edge of the foundation before the concrete was poured in, feet inside the trench. We ate lunch there, that my mama had prepared and my daddy said “this is where everything starts — if the foundation ‘ain’t’ right on everything, then nothing else will be right.” I think I was 6 when he said that, and I can still hear it in my memory as if it were yesterday. Tomorrow I turn 48. I grew up in a house that was small in size, but bursting at the seams with love. Today I call it a “crackerbox” house — asbestos shingle exterior, plenty of lead-based paint, 2 bedrooms, 1 bathroom. This small home provided shelter and stability for my parents, my brother, and me. My brother and I shared a bedroom until I was 13 and he was 14, when we moved to a nearby 3-bedroom, 2-bathroom house that we all thought was a mansion. In the 2-bedroom house, my parents’ bedroom adjoined ours on the back of the house. Across the front was a living room, a dining room, a screened porch, and a small kitchen. We had friendly neighbors and plenty of children to play with. We were able to walk to church. The school bus picked us up every day, and we would run to the bus stop early, even before breakfast, to put a book on the ground to reserve our spot so we could board the bus first (or second, or third). I remember my brother learning how to drive a car by driving in circles around our back yard (it was just a small subdivision lot, but he did it). I remember Daddy cutting the grass, and my brother and I would pick up the clumps. I remember exploring in the woods behind our house — such a wonderland! — and playing in the creek. I remember the safety and security we all felt as we lived in harmony in that little house, so full of love, and it was so wonderful to have two parents to nurture us, and teach us, and help my brother and I to grow our wings. 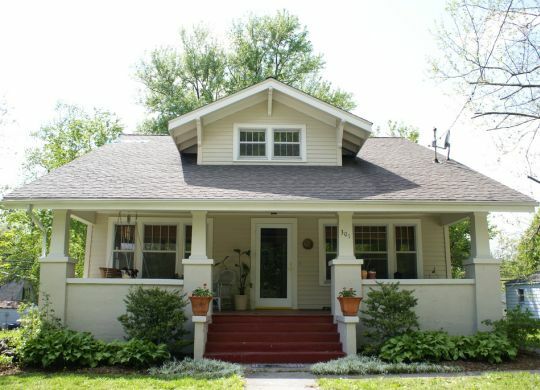 My parents paid $8,900 for that little house in 1950, and when they sold it in 1963 for $12,500, it gave a nice down payment for the larger house they bought for $16,500. The $16,500 house sold 12 years later for $35,000, when my parents paid $42,500 (in 1975) for a house in a better neighborhood, and that house sold last year (after both of my parents passed away) for $210,000. Making monthly payments on a 30-year loan meant the house was totally paid for, so when that house sold, the substantial amount of money it brought created quite a nice nest egg for other future investments. My brother bought his own home years ago, as I did, but we often marvel at the glorious childhood we experienced in that first little house, so full of love. I grew up in three homes, all in the same neighborhood, that my father literally built. Our family has had a home construction company for more than 110 years — 5 generations. As a pioneering heart patient, I was never expected to live, however, I did. And I attribute that to those who lived and loved in the home that built ME. Somehow just the right people I needed in my life for survival were there for me and had an unwillingness to give up. Medical researchers and doctors with bright ideas, surgeons with skilled hands, parents full of faith, hope and positive attitudes. Siblings and grandparents who helped me along the journey to a healthy recovery. As a pioneering heart patient, I was never expected to live, however, I did. My values have been formed by my all my life experiences, however they were most shaped by the childhood homes that built me. I chanced upon the Fuller Center for Housing (FCH) through the serendipitous suggestion of a friend who had herself never experienced a Global Builders trip first-hand. But I lost no time in signing up for my first Global Builders trip last year. The country I chose was Armenia, a land close to my heart. By the way, this is one of the features of the program — you choose the country where you would like to go. You can make repeat visits to that country (as I did to Armenia again this year) or you can go to different part of the globe to contribute your mite to provide affordable housing for the poor. The experience has been life-changing for me. The joy of working shoulder to shoulder with covenant families (who will dwell in the house when completed) and their neighbors, the local national staff of FCH, and fellow team members is indescribable. What makes it amazing is that you are meeting everyone else (including your team members) for the first time. But in a matter of minutes, you are working together, communicating through words (and gestures), and feeling a great sense of oneness and universality even if you are in that country for the very first time. The camaraderie builds as the days pass, sadly all too quickly. And when it is time to leave you really do not want to. It is almost as if you have known everyone else for a lifetime. I do not see my role as a do-gooder or benefactor. I have come to realize that I am equally benefitted; and that we all help each other in some way. It is this aspect of mutual assistance that is central to my experience. The house we all built together with love will be home for a dear family for years to come. The participation of the family in the construction and the repayment by them in manageable installments over a period of time are also important factors for me as they affirm the self-respect and self-reliance of the covenant families. The house that is built will be a house they can truly call their own. And it will have been earned by their own sweat and effort. In addition to making new friends in the host country, equally dear to my heart are the new friendships that are made within the team with fellow countrymen, women, and children. Yes, the team members are usually diverse in age, in professional and occupational backgrounds, religious affiliations, and geographical locations. Unlike other nonprofit efforts, the end results in the case of the Fuller Center for Housing’s Global Builders trips are not nebulous or intangible. They are, forgive the pun, concrete and tangible. And lasting too. The house we all built together with love will be home for a dear family for years to come. After the completion of the current year’s Millard Legacy Build at Vanadzor, Armenia, I suggested to the Fuller Center for Housing Armenia (FCHA) that they arrange a visit of the remaining members of the current team to the Karapetyan family’s home which had been constructed by the previous team the preceding year. FCHA readily agreed. And what a joyful event the visit turned out to be! It gave the Global Builders team an opportunity to see with their own eyes the fruit of the labors of a GB team — a lived-in house. And the Karapetyans, covenant partner family, were reassured that the Fuller Center’s efforts to provide affordable housing were continuing.